There are days when it seems, as Barbra says, like you could put one of your socks on a hook and catch halibut. Two-fish limits are the norm even on slow days. 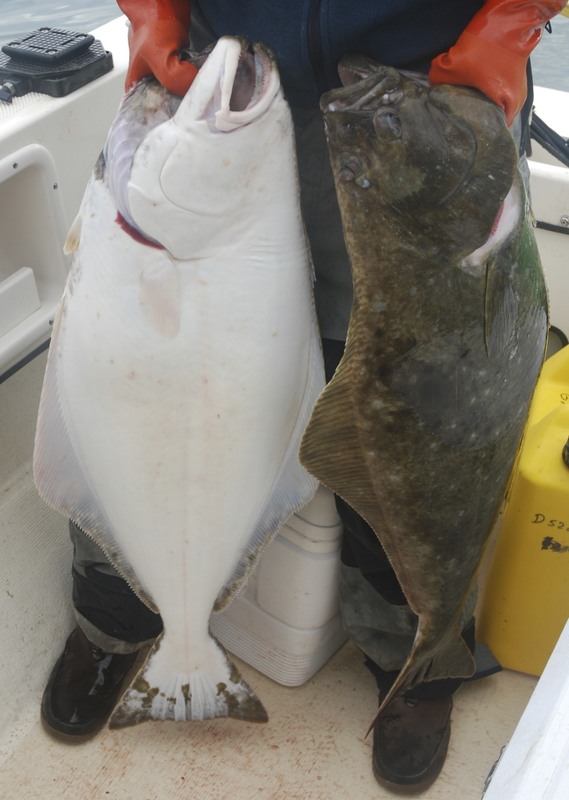 This brace of 20 and 25 pound fish came back-to-back and fell for twister-tails on five-ounce jigs in 80 feet of water near Homer. Halibut this size are referred to as “chicken halibut” and make for fine dining indeed. We love Alaska, but between the cold and our wanderlust, it’s unlikely we’ll remain here permanently. We dream about sailboats and warm beaches, about driving our camper all over Canada and the U.S., and about one day maybe owning a home on a few acres, complete with a clean, wood burning stove, a large vegetable garden, perhaps some fruit trees and of course a few chickens for eggs and for roasting. The good life comes in many forms! One thing that has dismayed us as we’ve looked for our next utopia is the state of many of America’s freshwater fisheries. Log onto a few of our states’ department of natural resources pages, look at fish consumption advisories, and a pattern soon emerges. Mercury and polychlorinated biphenyls (PCBs) contaminate most freshwater bodies, and some even contain unhealthy amounts of DDT–a chemical we’d thought was no longer a problem. Warnings and advisories recommending limited consumption of fish are the norm rather than the exception all across America as fallout from coal fired power plants, cement plants and other sources have laced our waters with unhealthy amounts of toxins. In some waters, it is recommended that no fish be eaten. More commonly – in our view shockingly – anglers and their families are advised to limit their consumption to just one meal of walleye, lake trout, bass or other fish per week or even less! That’s not very many fish dinners. The good news is that, thanks to increased awareness which has led to increased regulation of industry, levels of contaminants on many waters are tending downwards. Yes, keeping toxins out of our environment is expensive, but when we take into consideration health issues and quality of life, letting polluters pollute is even more costly. We have the means to keep our country clean, and that’s precisely what we should be doing. If industries won’t comply, then, yes, we need our government to intervene. Meanwhile, we feel very fortunate to live in a place where, with very few exceptions, people can eat as many meals of fish as they desire with the confidence that they are enhancing, not harming, their health. And so, at this point in our life, our “chickens” are of the finned variety. For now, our halibut omelets are made with store-bought eggs and Tillamook cheddar cheese. Maybe one day they’ll be made with eggs from our own chickens and cheese from our own kitchen!